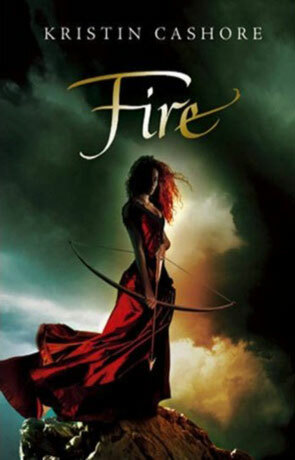 Fire is a fantasy novel from the new voice in fantasy, Kristin Cashore, author of Graceling. A sort of prequel to Graceling, Fire is set in a stunningly detailed, beautiful world, filled with very dangerous monsters. Fire is the name of one of the most dangerous of all, a human. Marked by her blazing red hair, she is mesmerising to look at, but enjoying this beauty comes at a high price. Fire gathers influence and power from people willing to do anything for her attention, and her affection. They will rebuke their families, the careers and their duties all for her. When some of these people are rulers of nations or people of power, this means whole kindgoms become neglected, whole nations are crushed, and power is abused. Fire is aware of her power, and also afraid of it, she lives in a corner of the world away from people, and away from temptation. Until the day comes when she is needed - a day when, for her king, she has to stand against not only his enemies, but also against herself. For Fans of Trudi Canavan or Patrick Rothfuss, this novel is a must read. An exceptional novel of fast paced action, evocative prose, deft characterisation with a truly gripping story, this looks set to be one of the strongest fantasy novels of the year. Written on 20th October 2010 by Ant.